In a somewhat obscure legal ruling, a judge has declared that the U.S. Federal Communications Commission does not have the power to prevent network carriers like AT&T from regulating the content that goes over their wires. Here's why this could mean the infopocalypse. Since 1970 or so, carriers like A. T. & T. and Verizon have been barred from blocking or degrading whatever is transported over their lines. 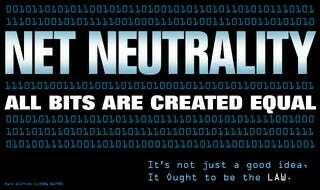 Although, at the time, the rule primarily concerned long-distance voice calls, that principle, applied to the Internet, has become known more recently as net neutrality. It offers a basic guarantee: that content providers on a network—whether it be YouTube, Wikipedia, or bloggers—can reach their users without worrying about being blocked, harassed, or forced to pay a toll by the carrier. Policing that rule in its various guises has been a core mission of the Federal Communications Commission for the past four decades—and keeping carriers away from Internet content has been among the F.C.C. 's most successful policy initiatives since its creation, in 1934. It is the Magna Carta of the Web; today, there's not a tech firm or a blog that doesn't owe something to the open, unblocked Internet. Without net-neutrality rules, a firm like Verizon or Comcast can do whatever it likes to content moving across its network. If it wants, it can make a blog that criticized its latest policies unreachable, or block T-Mobile's customer support. Acting together, the Internet service providers could destroy Netflix by slowing its data to a crawl, making movies impossible to watch. Such obvious outrages are unlikely; the firms will surely promise to behave themselves. But they might, instead, slowly begin bleeding money out of the Internet economy with quiet threats and expensive carrots, extracting fees and tolls wherever they can. "You better pay for 'turbo' access, Mr. Blogger, otherwise who knows how long it will take readers to reach your content." Or, to a new video-streaming service, it might say, "We're going to put Hulu ahead of you, unless you pay up"—meaning that its customers would have an easier time watching Hulu videos than content from the new guy . . .
That's not all. These days, Internet firms like Google and Facebook are so powerful that they could decide to turn around and demand that Internet providers pay them for the right to access their sites. This is the norm in cable television, and the situation was painfully illustrated to Time Warner Cable's customers, this fall, when they lost CBS programming for a month during a fee dispute between the two companies. (CBS ultimately prevailed in extracting higher fees to carry its content.) In the absence of net-neutrality rules—which set a norm of zero prices—we face the prospect of pricing wars pitting all against all, in the Hobbesian sense. The losers will be smaller speakers, nonprofits, and the consumer, who will be forced to pay more for less. We've talked before about how a lack of net neutrality could destroy the future of the internet. Now Wu says there's a simple legal strategy that FCC head Tom Wheeler can implement to prevent carriers and content providers from going to war — and leaving the little guys with no way to speak up online and get heard (and no way to get a decent streaming movie either). To find out what this strategy would be, read Wu's essay at the New Yorker.